Published by: (Public Domain), Barnes & Noble, Bello Games New York, Inc.
Checkers, also known as Draughts in many countries, is one of the most popular board games in the world and is played by two players (alternating turns). Checkers employs careful planning and attention to the plays on the board to win. While there are a number of variations, the most commonly played version is Anglo-American standard Checkers on an 8x8 board (on the same board as chess), with 12 checkers per player. One player has dark pieces and the other has light pieces. The Pieces move diagonally and pieces of the opponent are captured by jumping over them. The object in checkers is to capture all of the other player's checker pieces or to block them to move. There are many different ways to achieve a win. Players can try to get their pieces kinged to have more freedom of moving (also backwards) on the checkerboard. 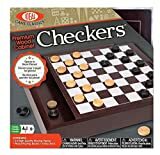 Checkers has simplistic mechanics that anyone can enjoy but at the same time has deep strategic concepts that are perfect for those who are craving for some intellectual challenge. The Checkers game can be played for fun or as a serious event like a checkers tournament by all ages. There are many ways beginners can learn and practice. 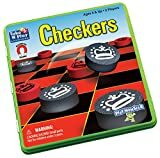 There are also books and magazines in which checkers strategies are highlighted and explained and Online checkers allows you to play and learn against a computer or a human opponent. The game of Checkers has roots which go back all the way to 1600-1400 BC in Egyptian art and has remained popular for years and years. By that time, the game was called Alquerque. Around the year 1100, a Frenchman put the Alquerque version on a chess board and added to the number of playing pieces to creating a newer version called "Le Jeu Plaisant de Dames". Later, when the jumps were made mandatory, the game was renamed as "Jeu Force". The rules of the game were published in books in the 1500s written by an Englishman. By then, the English version was called "Draughts," and the American version "Checkers". Since 1847, checkers championships are played in the U.S. and around the world.